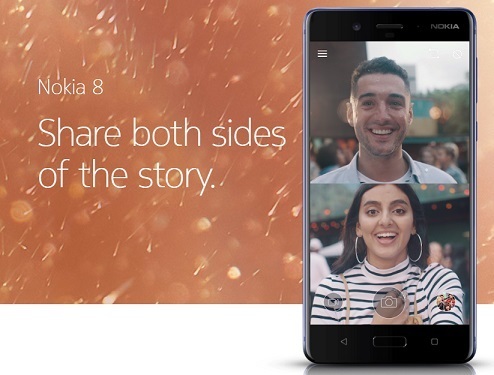 Nokia 8's exclusive Dual-Sight mode lets you use both front and back cameras simultaneously for split-screen photos and video.First in mobile phone,Nokia 8 also features OZO 3D audio technology. HMD Global has launched its latest android phone Nokia 8 with a unique feature.After the reentry Nokia had failed to make an impact in Handset market.But with the launch of Nokia 8,latest in android series,Nokia is on it's way back. Manufactures has come up with an innovative feature called Dual-Sight mode which lets you use both front and back cameras simultaneously for split-screen photos and video.It is surely first of it's kind out there in the handset arena.Can Nokia regain it's past glory?.Let's have a look at the new features of Nokia 8. Camera:Be less Selfie. Be more #Bothie. Cameras are designed not for selfie lovers,but for #Bothie lovers.Share your moments together. Super-slim cameras with ZEISS optics:Nokia 8 features a 13 MP dual image-fusion rear camera with both colour and monochrome sensors, plus a wide-angle 13 MP phase detection auto-focus front camera. Both front and rear cameras are equipped with ZEISS optics, meaning every snapshot moment becomes a story worth sharing. Use both front and rear cameras simultaneously with Dual-Sight mode.A first for mobile phones, the exclusive Dual-Sight mode lets you use both front and back cameras simultaneously for split-screen photos and video. Live video streaming to Facebook Live™ and YouTube Live with a single touch:Share the moment in the moment with built-in streaming straight to Facebook Live™ and YouTube Live. background noise. Coupled with 4K video capture.Nokia 8 is the first ever phone to feature Nokia OZO spatial 360° audio built in to its core. Chip-set:To maximize performance, Nokia 8 is built upon the cutting-edge Qualcomm® Snapdragon™ 835 Mobile Platform, engineered to deliver exceptionally long battery life and superior graphics performance. Liquid cooling: liquid-cooled copper pipe runs across the length of the Nokia 8, with graphite shielding dispersing heat from the Snapdragon chipset throughout the metal shell. it’s the perfect way to keep heat levels to a minimum, and thus – potentially – extend battery life. Unlimited storage with Google Photos. Google Assistant, always ready to help:From managing tasks and planning your day to controlling your favourite apps and smart home devices, Google Assistant is ready to help wherever you are.